Denver has been a boom-and-bust city since its early days in the middle of the 19th century. First there was gold, then silver. Then the railroads made it a center for the stock (as in cattle) market. Floods. Freezes. Mining, again. World War II brought in the defense industries. The energy crisis of the 1970s created a huge bump for the oil and gas industries. They fell along with the price of a barrel of oil, and the city stagnated once again. People moved away to the suburbs. But somehow the heart of Denver kept on beating. The area of Denver now called the River North Arts District (RiNo) was once part of Five Points. Most of the businesses and homes in that historic neighborhood centered around Welton Street and Curtis Park. A web of rail lines cut off access to the South Platte River, the western boundary of Five Points. So that whole part of the neighborhood became a no-man’s land of stockyards and noisy trains, only passed through on the way out of town. The city grew after World War II, settled by returning veterans who remembered the mountain views and the intense blue skies of Colorado as they passed through on their troop trains. The floods that plagued downtown for almost a century ended when the Army Corps of Engineers finally finished the Cherry Creek Dam. Businesses needed room. The rough edges of Five Points had space for warehouses, and access to routes out of the city. 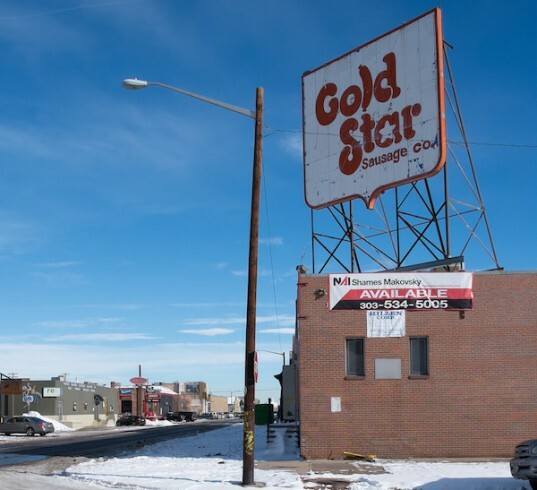 The Gold Star Sausage Company began in 1936 in Denver. They built a factory on Walnut Street in 1952, and made their famous sausages there for more than sixty years. But the old neighborhood was bleak and rundown. Gold Star’s processing plant decamped for Nebraska in 2014, wanting to be closer to meat producers. The building was sold. And that’s where our new showroom will be opening its doors this summer, in the fabulous old Gold Star Building. RiNo is rising from the industrial ashes, and has reincarnated itself as a mecca for those who love urban street life, with its cafes and restaurants and unique stores – and above all, art. If you love art and you love design, please come join us as we watch Denver flourish.